The universe was born 13.8 billion years ago. Astronomers estimate that the observable universe has more than 100 billion galaxies. The Milky Way is home to around 300 billion stars. 1. Fill up one cup of hot water and add a splash of white vinegar. 2. Add 1 tsp of canola oil or vegetable oil. Do not stir. 3. Place egg in the middle of the water and do not rotate. 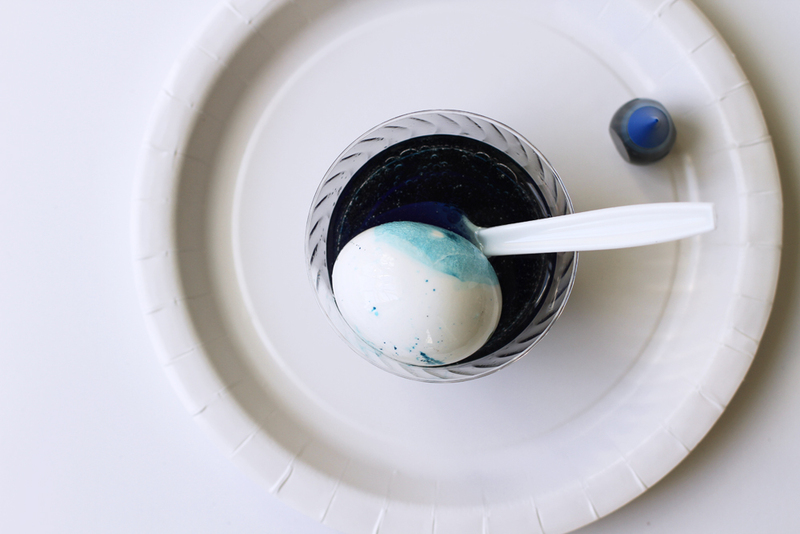 Put one or two drops of blue food coloring onto the egg and carefully turn in the water. The dye will only take to the areas not covered with oil. 4. Add two drops of purple coloring or red coloring now and rotate again. 5. Remove from water and pat dry. 6. Using your paper towel, carefully dot on some gold paint or "Gold Buff Rub". Let dry. TIP: It's best to use a blown out egg for this so you can keep it for years. If you use a hard boiled egg you cannot eat it after, because of the gold paint!